Agriculture, without doubt, is a key catalyst and drive behind both the economic and social sectors in Ireland. Ireland’s mild weather and rich soil content allows Ireland to devote 6.9 million hectares for agricultural purposes, employing over 10% of the Irish workforce. Although exportation is not wholly relied on, when we take into account the reduction of importation costs, the agri-food sector reports over 25% of net foreign earnings. It is thus clear that agriculture in Ireland holds incredible importance and without such emphasis placed upon it, Ireland would lack culturally, socially and of course economically. Ireland over the years, although moving towards industrialized developments, has held fast to its connection with the farming industry. This is most likely due to the parallel development of Ireland's exporting farm produce. In contrast to this, other countries may produce only enough in order to be self-sufficient, yet still there are some in Europe that will import needed food. This is not to say that the Irish are consistent in their levels of agricultural involvement. A detrimental drop occurred in the percentage of those that work in the agri-sector, in 1926 the impressive 53% saw a decline in 1990 to just under 13.5%. It is also difficult for Ireland to compete with those farms around the world that produce at a much larger scale, if we can compare that of a sheep farm in New Zealand and a farm in Ireland, averaging at 73 acres. These small farms are incredibly vital to Irish agriculture, as with not many large contractors, Ireland relies on these low sized farms as a driving force. This doesn’t mean that Ireland is in somewhat lacking, it is accountable for over 28% of exports in forest and fishery exports, second to Denmark who sits at 34.3%. When we take into account all the land in Ireland used for agricultural purposes, it amounts to an impressive 61.36% of total Irish land mass. Ireland all together is a total of seven million hectares, when we take into account that a total of 4.2 million out of that is devoted to agriculture it is not surprising when we hear of over 134,500 family owned farms in the country. Ireland’s agriculture is above all a grass-based industry. Beef and dairy produce is one of the largest exports that Ireland offers, accounting for just off 60% of Irish outputs. In 2002, Ireland sent out over 445,000 tonnes of beef adding up to €1,185 million in worth. Also in 2002, 126,000 cattle were exported live from Ireland which was also worth an impressive €70 million. This is just some evidence of the cattle farming’s worth and back up to Ireland being the biggest EU exporter of beef, and up near the top of the largest of the world. Not only the beef but the Irish dairy farms in 2008, produced over 5,437 million litres of milk, only 472 million of these were as sold as liquid, the rest was placed into the production of other dairy products. Sheep are also at large in Ireland, counting up to over 9.1 million, cattle are mainly kept inside, whilst sheep are let out, until the intensive lambing season. In 2009, over 47,850 tonnes of sheep meat was exported which was worth just under €167 million, most of these outputs going to both Britain and France. Pig farming is not as widely common as it raked in €325.6 million last year, yet it is surprisingly successful in the small amounts it presents itself. At present, there are over 1.5 million pigs, in the EU continental market Irish pig meat accounts to 34% whilst the remaining 17% go internationally. A favourable climate allows Ireland to grow grass very well; this is because of Ireland’s long periods of rainfall and reasonable temperatures which result in good, moist soil. On the contrary, tillage crops need a phase of dryness to allow seed-bed preparation, seed sowing and also then there is some additional needed time for the ripening and harvesting of the crop. Due to these necessary conditions, tillage is mainly in the east, south-east and south of the country. 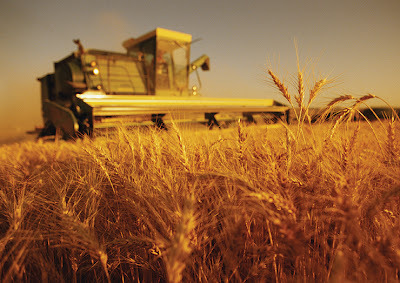 Crops include barley, wheat, oats, potatoes and horticultural crops. Barley is mainly grown for animal-feed accounting for over 75%, whilst the remaining 25% goes towards malting. This crop allows Ireland to be 60% self-sufficient when it comes to animal feed. Wheat and oats on the other hand, are not only used for animal feed, but also for human use, more so oats on the human scale than wheat. Ireland has been known around the world to be one of the largest consumers of the potato crop, it is largely useful that Ireland is self-sufficient in this area. The horticultural sector has seen to have grown over the last 20 years, it is mainly focused on crops such as field vegetables, mushrooms and tomatoes, alongside other protected crops. Although very little of Irish agricultural land is devoted to the horticultural sector, it seems to be a worth-while and of considerable worth. Currently about 0.40 million ha of Ireland is under forest, this accounts to just of 5% of Ireland’s total land mass. This is the lowest in Europe, and considering that the majority of our cultivated forest-land has only been planted since 1901. A past project in 2005, saw the planting of more forests placed an additional 9%, totaling at just over 14%. This is a great improvement, yet Ireland is still ranked the lowest forested country in the EU. Considering the climate, Ireland has done quite well. Forests in Ireland are mainly harvested and are condensed to the mountainous and hilly areas. 95% are conifers and are mainly state-owned. The lack of forestry involvement could be due to the over-harvesting of seen in the 17th-19th century, with no re-planting. Since this, Ireland has seen to adapt its land therefore to a more livestock based production, almost cutting out forestry to some extent. Ireland also has a strong aquaculture sector. Although Ireland has suffered over-fishing in the last 15 years, there is a stronger and stricter management policy imposed to the Irish waterways dealing with freshwater salmon and sea trout. Ireland in the past has also traditionally been reliant on its peat extraction. Historically, it has been incredibly beneficial to the Irish economy, but that since has depleted as bogs are now more environmentally preserved and more efficient fuels have taken its place.